Looking for information on small fishing boats? Please read our guide below on the best small fishing boats available today. For the novice, or even those with more experience, deciding which type of boat to purchase can be a somewhat daunting experience. Even trying to gain information from one of the many hobby fishing magazines can sometimes prove frustrating, what with the technical jargon used and the sheer wealth of information. After all, when you’re talking about the different type of fishing boats, prices, pros and cons of each, where you want to fish, motor versus row boat… etc, etc, it soon becomes clear that doing your pre-purchase homework is essential. And naturally, safety whilst on the water should be your first priority. Along with the purchase of your boat, there are other issues that should be considered that are just as, if not even more important, than the type of fishing boat you decide on. Familiarising yourself with river and/or sea charts. Learning the rights of way when it comes to other boat users. River and water currents, and what they mean to you as a boat user. Knots, their uses and becoming adept at tying them. So when it comes to looking at the types of fishing boat that will perfectly suit you, then the first thing to do is narrow down the type of boat that you’re looking for. For instance, price might well be the driving factor, in which case our page on cheap fishing boats will be of interest. And the type of fishing you do will also have a huge bearing on the boat that will be the best for you. If you river fish, then the perfect boat for you will differ from those who fly fish. 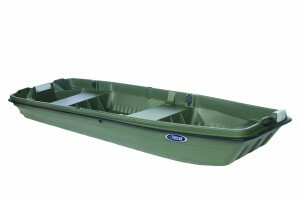 Or perhaps you might want a lightweight, plastic fishing boat, or a boat to go sport fishing. Of course, for the hobby fisherman (or woman, because many ladies also enjoy this wonderful sport), then there are many boats that will happily cover a multitude of needs. Below you can see our ‘top 5’ list of what we consider to be the best small fishing boats. If you want space, durability, and a boat that promises high speeds (with motor added) on the water, the Pelican Intruder fishing boat offers a lot of bang for the buck. The boat is super durable, with a Ram-X hull. This is a spacious boat and you can pack in several people plus gear, tackle, and snacks as the boat supports weight up to 426 pounds. The Intruder features bench seats and four vertical fishing rod holders, perfect for a day at the lake. The durable hull is made of Pelican’s® proprietary RAM-X™ multi-layer material that is highly impact resistant and features a UV-protected finish. The boat features motor mounts on both the bow and stern. For carrying weight and promising speed this boat has a lot of potential once a motor is added. The boat also features carrying handles for making transportation from your vehicle to the water hassle-free. Built in motor mounts, on the bow and stern. Promises years of fun fishing, safety, and durability. Color may fade if not covered. Offering a spacious, comfortable ride, if you’re looking for a fishing boat that will provide you with many years of fishing and boating pleasure, the Pelican Intruder 12 is the boat for you! The Sun Dolphin Pro is a rugged fishing boat boasting many envious features. It packs a lot of bang for its buck and features conveniences you’d typically have to pay a lot more for. Some of the many features the Sun Dolphin includes are two swivel fishing chairs which provides the ultimate in visibility. Six storage components– three within reach of each chair, allow you to fish while searching for the perfect tackle or lure. The boat also features an aerated well for storing your catch until you get home. Two rod holders allow you to take a break from your rod and reel while getting a drink or stretching. The Sun Dolphin Pro is constructed from super-rugged thermoformed High Density Polyethylene with a tri-hull design, the boat promises excellent stability and resilience to abrasions, rocks, or tough waters. The boat supports up to 462 pounds of weight, while being light enough to be powered by a small outboard or just an electric trolling motor. Super-durable, loaded with features, and supports a lot of weight. The rear tie downs are in the back and not the sides. The Sun Dolphin is designed for the true fisherman as it’s designed to put everything within reach while fishing – the storage compartments, drink holders, everything, are in easy arm’s reach of each chair. Choose this boat and you’ll never miss a catch again because of leaving your spot to find gear. If you’re looking for a tough, motor ready boat that is lightweight and offers a super-stable ride, the Pelican® Bass Raider 10E Fishing Boat is the boat for you. This small but sturdy boat is perfect for trolling around narrow areas in search of fish. The boat is built of impact-resistant Ram-X ™ material, a multi-layer material exclusive to Pelican boats. The boat also features a super-sturdy tri-keeled hull. The boat also sits on two sturdy pontoons for added stability. The boat is also prewired for electric trolling motors and includes two mounts on the bow and stern. The Pelican® Bass Raider 10E Fishing Boat comes with all kinds of extras to make your day on the water full of the little conveniences. 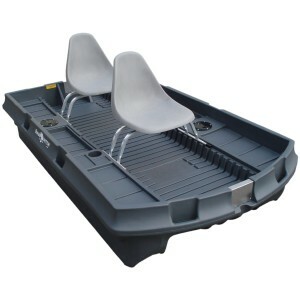 First, the boat has two carrying handles for getting this lightweight boat to the water with ease. The boat also features two fishing road holders, so your hands can take a break from the pole now and then, as well as two drink holders and two swivel fishing chairs. The chairs are removable so you can fit several people into the boat. The boat is also equipped with multiple storage compartments for storing bait, tackle, beverages, and other fishing gear. Super stable but not super fast. 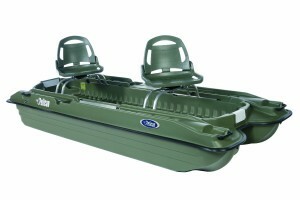 Overall, this is a rugged, durable boat that will provide you with years of fishing pleasure. It offers all the convenient accessories and extras one would hope for and provides all of this for one super-affordable price. 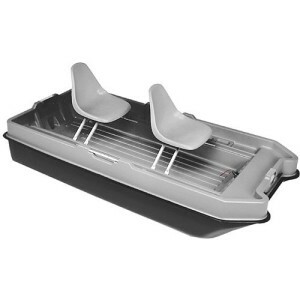 A great value inflatable pontoon boat that allows you to chose from three separate oar lock positions. Made from high quality, easy maintenance materials that include powder coated steel tubing for the frame and abrasion resistant PVC. For those that put their boats under extremely heavy use, this lightweight version might not prove robust enough for their liking. Arguably one of the best small fishing boats you can find for the price. Light enough to easily lift onto a roof rack on the top of the car, and comes with a good warranty that covers you for any damage experienced in the construction. It also has dual air chambers, meaning that if you do experience a leak then there are no worries about staying afloat. A great boat that honestly does provide amazing bang for your buck! With some great built in features, this is a low cost, yet high standard fishing boat that’s both lightweight and durable. It weighs 100lbs and has a load capacity of 550lbs. 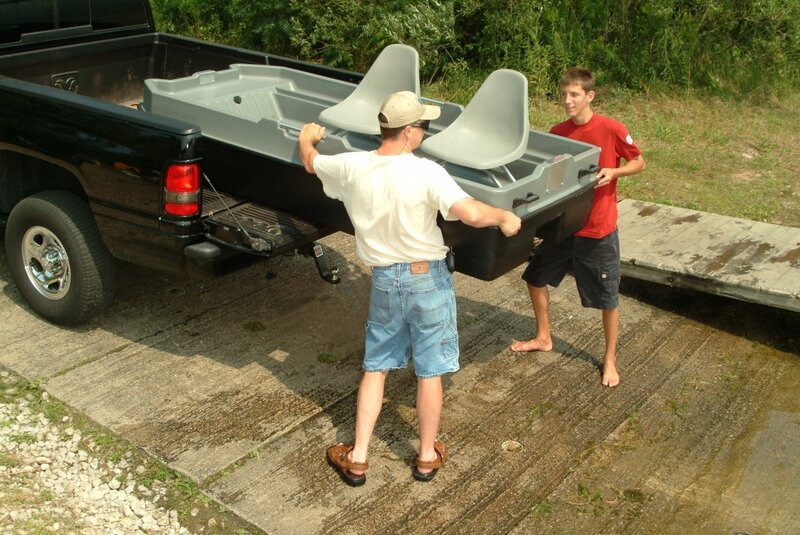 The size and weight of this boat make it particularly easy to transport, fitting easily into a truck bed or van, or can be moved using a utility trailer. Extremely durable and hardwearing small fishing boat. Built for longevity, and will last for many years. Very stable, allowing you to fish from either a seated or standing position. Excellent in shallow water, so increasing your choices of fishing area. Very low maintenance, as well as being easy to handle and move around due to its light weight. Due to its light weight, the boat is more susceptible to wind than heavier boats. In general, this is an excellent boat that represents fantastic value for money. It’s a very versatile choice, requiring little on-going maintenance and also has an excellent load bearing capacity. One huge advantage is that it really does provide enough room for two fishermen to carry all their kit with them, a feature sadly lacking in many other boats of this size, calibre and price range. A small, extremely easy to transport and handle boat that’s been superbly designed to provide all this yet doesn’t compromise on stability. Ideal for those who wish to navigate shallow water, narrow channels and fish in places that gas powered boats are not allowed to go. Swivel seats and adjustable seat frames. Provides plenty of storage room not only for additional kit, but for rod and tackle storage as well. Weighs a mere 130 lbs. Has narrow pontoons that really do allow for excellent tracking on the water. The plastic seat can be a little uncomfortable if sitting in it for extended periods of time. Perhaps one of the most stable fishing boats you can find in this size and price range. The light weight and the inclusion of wheels on the base make loading and launching extremely easy, and really is a one man job. Very low to the water, which as ever fisherman/woman knows, makes for a great day’s sport. This is a boat that has flotation devices to hold the boat on the top of the water. There are two types: a catamaran, which has two floatation devices (pontoons), or a trimaran, which has three. Low cost for the load capacity. Can be cheaper to insure than other types of boats. Can be used as row boats or have a motor fixed for propulsion through the water. It’s possible to navigate extremely shallow water in this type of boat. If a large force is applied to one side, a pontoon boat has the risk of capsizing, especially if top heavy. Sport fishing boats are ideal for the more serious angler who’s looking for the biggest or largest variety of fish to catch. Different types hold different numbers of people, and they can be found in rigid hull or inflatable pontoon construction. Generally small and easy to manoeuvre, meaning you can reach areas of water that larger boats are unable to. Usually well designed to provide plenty of storage space for you fishing kit. Designed to give good stability whether you’re standing, sitting or sitting side-saddle to fish. As these are produced for sport fishing, they don’t really double up as general use boats. Catamaran Fishing Boats are twin hulled boats that can be made from a variety of materials. The hulls can be rigid or inflatable, and in general are lighter than traditional hulled boats. The twin hull design causes less drag in the water than a traditionally hulled boat, therefore they are easier to power forward (either by using oars or an outboard engine). They are also wider than single hulled boats, making them considerable more stable. Catamarans often have an excellent amount of storage room thanks to this extra width. The twin hull design does make them a little less easy to manoeuvre in the water and slower to turn. 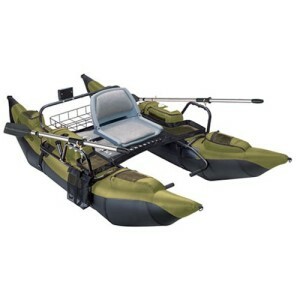 By plastic fishing boats we’re talking about inflatable PVC boats. These can often prove a fantastic choice for the hobby or more serious fisherman, as they are extremely versatile. In general they are easy to inflate and deflate, and extremely tough in construction. Many people find that plastic fishing boats are the answer to storage and carriage problems. Can be found in different sizes, making them ideal if you want take the family or a friends fishing. Very stable, making them ideal for different fishing positions, including standing up. Once deflated, require little storage space at home. Does require a little time to inflate and deflate.